receive the Friends’ Letter three times a year, which gives early notice and details of the forthcoming performance, and the Annual Concert Diary. be able to book seats for our concerts two weeks before tickets go on sale to the choir members and the general public. benefit from a discount on the ticket price. see your name listed in the concert programme, to show our grateful recognition of your support. Subscriptions are renewed in April each year, currently at £15 for a single membership and £20 for a double. A double subscription is not restricted to couples only; if two people regularly attend concerts together, they may apply jointly for a double membership. We are always pleased to welcome new Friends. 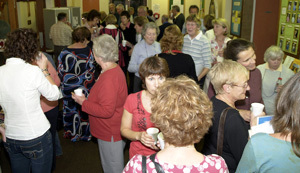 If you need more information please click here to e-mail the Friends secretary, Sue Maguire. Click here to download the application form in PDF format.